FINDING: In most Mexican groceries, natural foods (bulk) stores and some well-stocked general groceries. Toasted ones are occasionally available in the snack aisle. CHOOSING: Hulled seeds give a fuller flavor and richer texture to sauces. 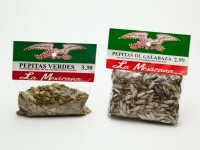 Unhulled seeds (usually only available in Mexican markets) give an earthier flavor. Seeds that are clean and intact, with a vibrant color, are typically the ones with the fullest, freshest flavor. STORING: In a cool, dark, dry place, preferably in a sealed container, for up to a month; frozen for up to 6 months.